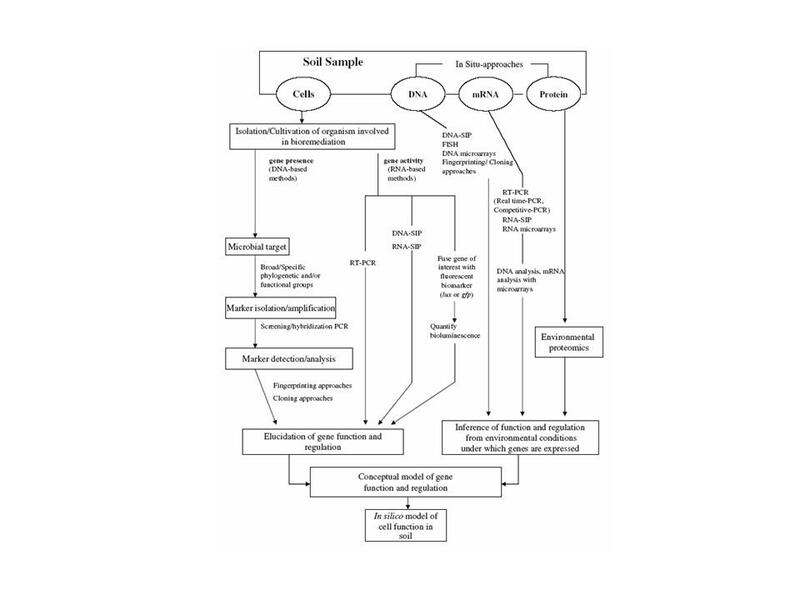 Keywords: Xenobiotics; enzymes; soil bioremediation. In the second part of the twentieth century, intense environmental pollution has been one of the biggest concerns for science. Xenobiotic chemicals are continuously released into the biosphere because of several industrial and/or agricultural activities. In particular, the rapid industrialization of agriculture, expansions in the chemical industry, and the need to generate cheap forms of energy have all resulted in an ever-increasing reliance on anthropogenic organic chemicals and caused the contamination of the atmosphere, the hydrosphere and the soil environment. 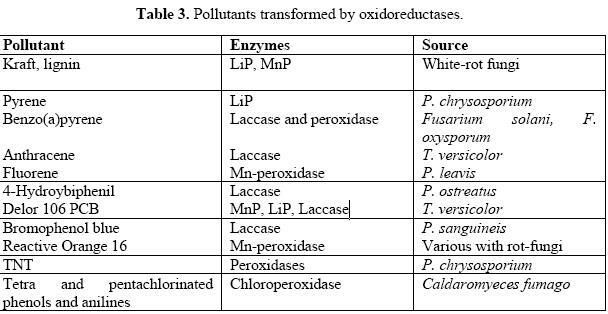 Examples of xenobiotics very dangerous for the environment and considered very often priority pollutants are shown in Figure 1. Highly halogenated monoaromatic compounds, including tetra and penta-halogenated phenols and anilines, are widely distributed pollutants. They are present in the environment either as naturally-occurring or synthetic introduced compounds, being used for a wide range of domestic, agricultural and industrial purposes. Pentachlorophenol (PCP) and the lower chlorinated phenol, tetrachlorophenol (TCP), are still intensively used as fungicides, herbicides, insecticides, and precursors in the synthesis of other pesticides. Their production is currently made in countries such as China and Mexico, although, for instance, PCP production in USA and in Europe has been banned since 1992 and 2000, respectively. Their recalcitrance depends on the number, type and position of the halogen substituents. The removal of halogen atoms from aliphatic and aromatic halogen-carbon-substituted compounds is an essential step in their biochemical transformation and the reaction reduces or eliminates toxicity. The chemical properties and quantities of xenobiotics determine their toxicity and persistence in the environment. Their interaction with targeted and non-targeted organisms has extensively damaged the ecosystem through entry into the food chains. The net result has been bioaccumulation and biomagnification of these xenobiotics in aquatic and terrestrial organisms. Adverse effects in humans and other organisms such as acute toxicity, carcinogenesis, mutagenesis and teratogenesis, have been observed from the presence of many of these compounds at high concentration or following prolonged exposure. This is the consequence of the general high resistance of these toxic compounds to physical, chemical or biological degradation, thus constituting an environmental burden of considerable magnitude. Also substances not toxic at low concentration may accumulate in the environment and produce adverse effects on environmental health. Such ecological stress, imposed by massive amounts of xenobiotics, is partially surmounted through natural, mainly microbial, attenuation. While microbial attenuation may be almost infallible, it is not adequate to protect the biosphere from indiscriminate agricultural and industrial activities. This may be because (i) xenobiotics are relatively new to the biosphere (ii) enhanced resistance to attenuation is inherent due to unusual chemical bonds or functional groups in their structure, that do not (or seldom) occur in nature (iii) microbes have not had enough time to evolve suitable metabolic apparatus to deal with incorporated xenobiotics. Therefore, they not have appropriate metabolic pathways for them and (iv) only a few microbes have evolved with the ability to sustain in adverse ecological states. Therefore, a solely biochemical explanation is not sufficient for explaining the accumulation of such compounds. Efficient degradation involves various factors, such as bioavailability of the substrates, which have to be understood. Furthermore, the substrate has to diffuse or be transported into the cell. Besides these factors, the organism capable of degradation must be present at the site where it is needed and it has to perform under the given or manipulated environmental conditions. Thus, a combined approach is required to understand the bottlenecks of xenobiotic degradation, to rationally overcome them by different methods, to elucidate the microbial metabolic diversity, and to understand the metabolic and organismic network necessary for activity under environmental conditions. Several strategies may be adopted to efficiently improve the process and help natural biodegradation processes work faster These biological methodologies, collectively indicated as bioremediation, and usually considered environment-friendly treatments, constitute essentially a managed or spontaneous process mediated by living organisms (mainly microorganisms), which degrade or transform contaminants to less toxic or non toxic products, with mitigation or elimination of environmental contamination. The use of plants (phytoremediation) and their associated microorganisms has been also considered as an appealing technology to degrade, contain or render harmless contaminants in soil or groundwater. Intra-, ecto- and extra-cellular enzymes are, ultimately, the main effectors of pollutant transformation during plant and/or microbial processes. Enzymes perform a wide range of very important functions throughout nature. They are highly specific and efficient, guiding the biochemistry of life with great precision and fidelity. This fidelity is essential in the cells of living organisms, and a multitude of mechanisms have evolved for controlling the activity of these enzymes themselves. Enzymes play a key role in harvesting energy from the sun via photosynthesis, perform a wide range of metabolic functions throughout every living cell in the bodies of plants and animals, and are in fact really the catalysts of all biological processes constituting life on earth. Enzymes production (mainly of extra-cellular enzymes) is controlled by several factors including at the organism level the pairing of low-level constitutive synthesis with induction-repression pathways, and at the microbial population and community levels the quorum-sensing systems that regulate unique and varied cellular responses as well as protection from competing microbial communities. The quorum-sensing systems allow bacteria to monitor their environment for the presence of other bacteria and to respond to fluctuations in the number and/or species present by altering particular behaviors. Most quorum-sensing systems are species- or group-specific, which presumably prevents confusion in mixed-species environments. However, some quorum-sensing circuits control behaviors that involve interactions among bacterial species. These quorum-sensing circuits can involve both intra- and interspecies communication mechanisms. Finally, anti-quorum sensing strategies are present in both bacteria and eukaryotes, and these are apparently designed to combat bacteria that rely on cell-cell communication for the successful adaptation to particular niches. Many enzymes of both microbial or plant origins have been recognized to be able to transform pollutants at a detectable rate and potentially suitable to restore polluted environment. The main enzymatic classes involved in such a process are: hydrolases, dehalogenases, and oxidoreductases. Amide, ester and peptidic bonds undergo hydrolytic cleavage by amidases, esterases and proteases in several xenobiotic compounds and may lead to products with little or no toxicity. Hydrolases responsible for the cleavage of pesticides are among the best studied groups of enzymes. Most of these hydrolases are extracellular enzymes, except for the cell wall-bound enzymes of Penicillium and Arthrobacter sp., which hydrolyze barban and propham, respectively. Evidences have been provided that lytic enzymes produced by many fungi and bacteria are strictly involved in the microbes' antagonism toward plant pathogens and pests. Exoenzymes possessing chitinolytic, glucanolytic, cellulolytic or proteolytic activities can be used individually or in combination to provide an enzymatic basis for a number of processes, which ultimately lead to a biocontrol effect. Very interesting is the findings that selected strains of Trichoderma introduced in rhizosphere soil rapidly catabolised phytotoxic concentrations (10 mM) of cyanide trough the action of two cyanide catabolizing enzymes: formamide hydrolyase and rhodanese (Lynch 2002). As reported above, many xenobiotics contain halide atoms bonded to aliphatic or aromatic carbon. Therefore, dehalogenation reactions are important initial steps in the degradation of such xenobiotics. (c) Spontaneous dehalogenation of unstable intermediate products of unrelated enzymatic reactions. 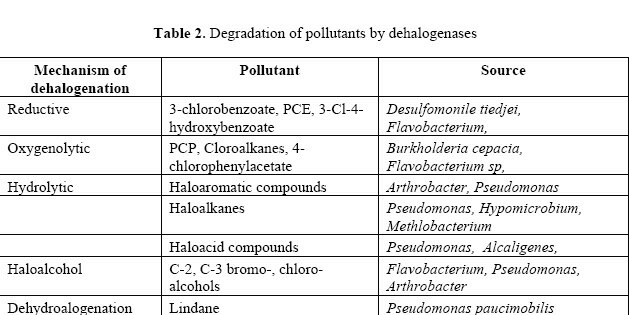 Examples of degradation of pollutants by dehalogenases are reported in Table 2. Figure 2. 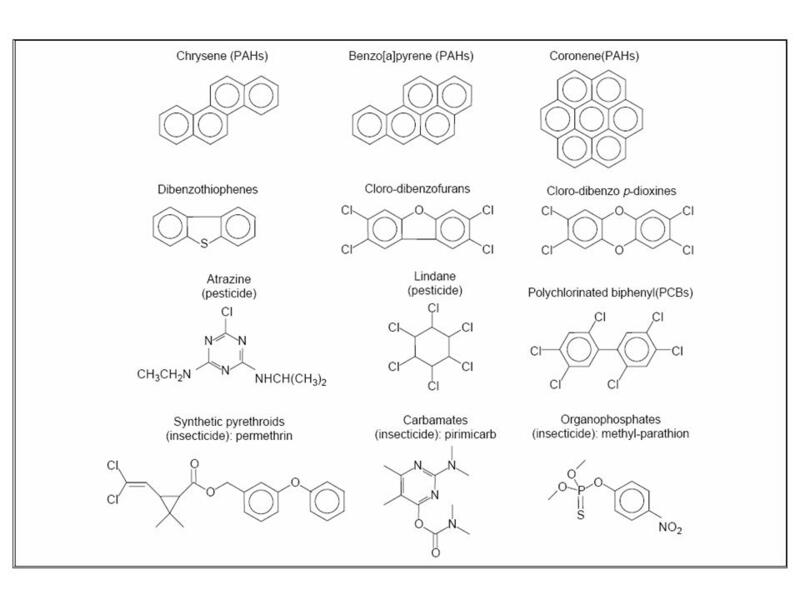 Microbial strategies for remediation of nitro-aromatic compounds by aerobes (i, ii, iii and iv) and anaerobes (v) (after Kulkarni and Chaudhari, 2007). Oxidative processes, carried out by oxido-reductases, are very important in the bioconversion of xenobiotics, especially bioconversions which follow hydrolysis and dehalogenation of the parent compound. In this case, the basic reactions are hydroxylation, followed by cleavage of the aromatic ring, oxidative 0- and N-dealkylation, and epoxidation. Certain compounds, e.g. derivatives of aromatic acids, are completely degraded due to the involvement of oxidative enzymes. Moreover, oxido-reductases may catalyze the oxidative coupling of reactive compounds through formation of highly reactive free radicals and production of polymeric products by self-coupling or cross-coupling with other molecules Dechlorination, demethoxylation and decarboxylation during coupling and polymerization of differently substituted substrates may also occur. As also seen above, a key role in the transformation of xenobiotics is performed by oxygenases. Mono- and dioxygenases catalyze essential steps of the metabolic pathway of several toxic compounds. Indeed, alkanes, aromatics, chlorophenols and nitrophenols, and PAHs are oxidatively degraded by bacteria and mediated by either specific or non-specific oxygenases. Another important group of enzymes particularly effective in the transformation of pollutants is formed by the lignin-degrading systems produced by fungi and involved in the transformation of lignin. Lignin-peroxidases, manganese peroxidases and laceases are the main enzyme belonging to this systems and they are responsible of the transformation and removal of a long list of pollutants of different nature and dangerousness (Cameron et al., 2000, Esteve-Nunez et al., 2001, Verdin et al. 2004, Ruggaber et al., 2006, Longoria et al 2008) (Table 3). These enzymes are typically extra-cellular thus allowing their isolation and purification to be achieved more easily than intracellular enzymes. For instance, a complex system of extracellular non-specific peroxidase to degrade a wide range of nitro-aromatics including TNT was evolved by Phanerochaete chrysosporium and other fungi (Esteve-Nunez et al., 2001). Plants also harbor highly versatile enzymatic machineries to attack and detoxify pollutants. Similarities to the mammalian detoxification led to the coining of the term green liver for plant xenobiotic metabolism. Important enzyme classes such as cytochrome P450 monoxygenases, glutathione S-transferases, glycosyltransferases and transporters are involved in both kingdoms. The availability of the first whole plant genome sequence oí Arabidopsis thaliana revealed an unforeseen complexity of these enzyme classes. Genetic and biochemical diversity, by far exceeding at least single microorganisms, seems to exist in plants. In agreement with previous investigations at the enzymatic level both terrestrial and aquatic plants possess an enormous potential for phytoremediation of soil, water and air if limitations due to insufficient uptake into plants can be overcome. Although this large array of enzymes with a potential for the remediation of polluted environments, several shortcomings still exist limiting the potentiality of enzymes and leading to the prolonged persistence of pollutants in the environment. Indeed, the main drawbacks in the extensive application of enzymes in the in situ restoration of polluted environments lie in the limited knowledge of the biochemistry of the degradation processes, in the short catalytic life of enzymatic proteins in harsh environments such soil, in the need of more than an enzyme acting sequentially or of cofactors and coenzymes acting simultaneously to the enzymes. Another, not minor bottleneck restricting the use of enzymes, is the limitation still existing in methods suitable to improve their performance and to actually identify their involvement in the process. 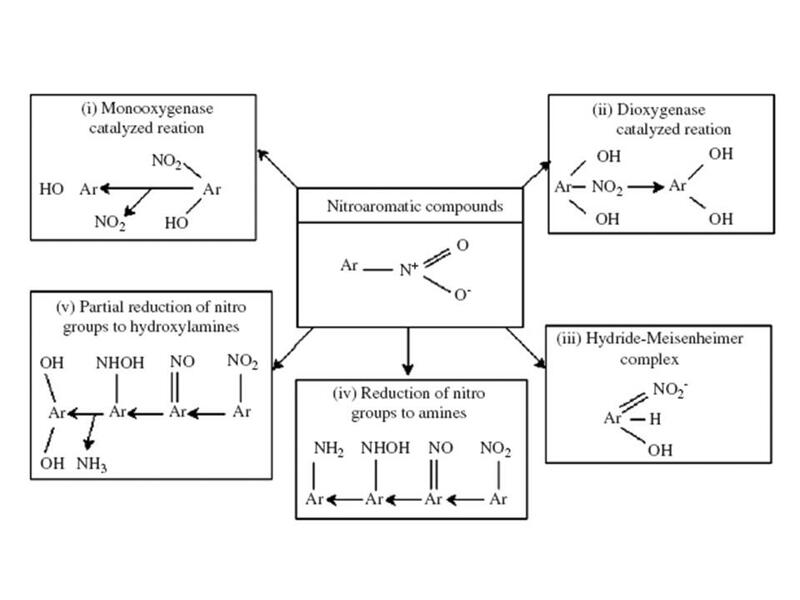 If reference is made to nitroaromatics, microbial transformation of nitro-aromatics in nature occurs at a relatively slow pace despite the presence of several nitroreductases in most organisms. Secondly, enzymes for complete catabolic breakdown of nitro-aromatics are very rare. Specificity of these enzymes renders them yet slower on analogous substrates. Thirdly, a variety of intermediates render them yet slower. Two basic approaches can be addressed to improve the efficiency of an enzyme-catalyzed process of pollutant transformation, and their applicability and effectiveness will depend whether isolated enzymes or whole cells are used. Traditional approaches are based on the improvement of the performance of the selected enzyme by acting on the conditions under which the enzyme displays its catalytic activity. Advanced approaches will improve the enzyme itself. In other words, the intrinsic and inherent catalytic features of the enzyme will be optimized. Indeed, the increasing information on the structure and function of catabolic enzymes and pathways offers further possibilities for their optimization. Examples of traditional approaches, mainly addressed with isolated enzymes, are: a) the use of additional compounds acting as co-substrates or mediators (Figure 3) (Cabana et al., 2007); b) the use of additives as ameliorant of the enzyme activity; c) the modification of enzymes by appropriate molecules, d) the use of more than one enzyme acting simultaneously or in sequence. An example of enzyme modification is that of an organophosphorus hydrolase (OPH) by the addition of an N-terminal dodecahistidine tag (Hisn-OPH). 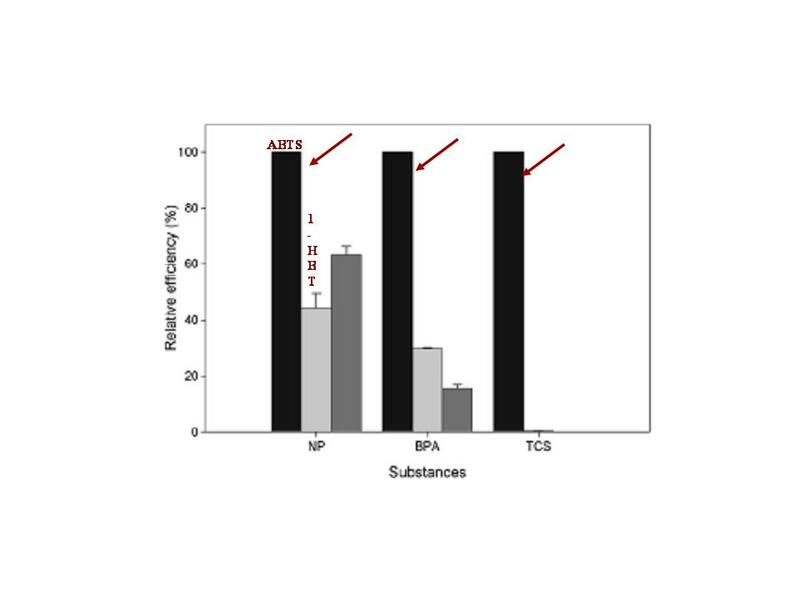 The introduction of the Hisn-tag caused a 30- and 74-fold increase in catalytic efficiency of the enzyme with parathion and methyl parathion, respectively, compared to OPH. Advanced approaches are based on strategies to take existing catabolic pathway genes and generate optimized enzymes and pathways (Parales and Ditty, 2005). A rational site-directed mutagenesis approach to improving enzyme function is possible if a detailed characterization of a given enzyme and at best the crystal structure is available. Alternatively, sequence alignments can help in identifying residues critical for enzyme activity (usually highly conserved) or substrate specificity (usually visible as differences in the sequences), and a rational design can lead to improved biocatalysts. Besides such site-directed approaches, various DNA-shuffling methods (i.e. the random fragmentation of a population of mutant genes of a certain family followed by random reassembly) have been developed, which allow the creation of a vast range of chimeric proteins and protein variants. 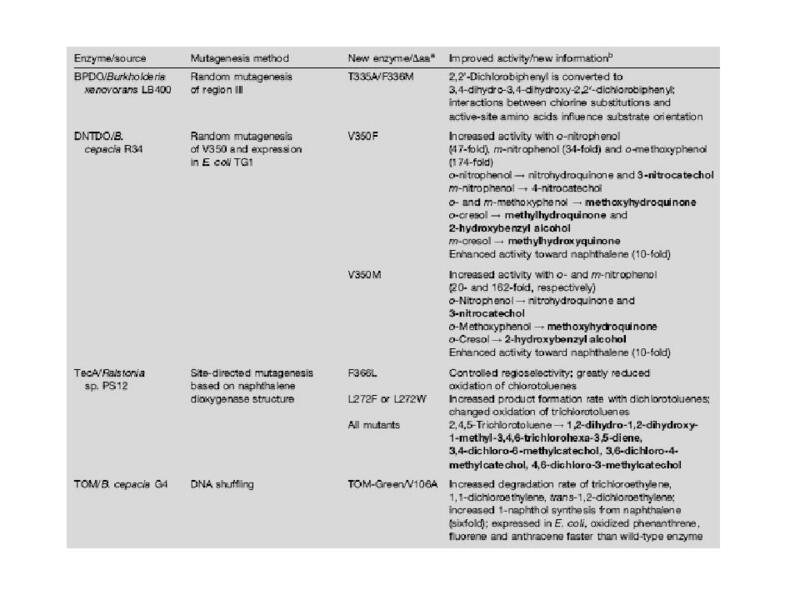 Examples of catabolic enzymes with new or improved activities are reported in Table 4. Such techniques can be also used to generate biosensors for the identification and quantification of environmentally relevant chemicals. Moreover, to claim that a given enzyme or group of enzymes have been involved in the remediation of a polluted site, it is necessary to relate protein presence to the biochemical transformation of the pollutant and to identify the source of organism for specific enzymes. Several chemical methods are available to evaluate the concentration of a pollutant and its depletion in a contaminated site. They include gas chromatography (GC), GC/mass spectrometry (MS), GC/flame ionization detector (FID), infrared (IR), fluorescence spectroscopy, luminescence techniques, and the method known as SIP that relies on the changes in stable isotope composition of the molecule of interest. Advanced strategies based on a set of different genomic and proteomic approaches (Figure 4) are now available for monitoring the site under bioremediation. As reported above, one of the main questions remaining after a bioremediation process is to assess that the toxicity at the contaminated site has been lowered and the site has regained its initial biological activity and productivity. Therefore, toxicity tests and biological activity measurements may be used as potential monitoring tools or bioindicators during and after bioremediation of contaminated sites. In spite of the possible drawbacks previously cited, in the restoration of polluted environments biological processes have more merits than physico-chemical processes as (i) no harmful intermediates are generated, (ii) complete destruction of the xenobiotic to C1 is feasible, (iii) in situ bioremediation of several xenobiotics is feasible, (iv) the process is eco-friendly and economically sustainable, and (v) it enjoys wide public acceptance (Kulkarni, and Chaudhari, 2007). As claimed by Reiner and Pieper (2000) "It is evident that we are just beginning to understand and, thus, to fully exploit the natural diversity for biodegradation and bioremediation purposes. New genes, enzymes and metabolic routes involved in bacterial xenobiotic degradation have been discovered, and new methods have been developed, which allow the discovery of the broad flexibility of microorganisms. Besides application of the natural diversity, the artificial evolution of enzymes and pathways will lead, without doubt, to improved biocatalysts and high-throughput methods of screening for the desired phenotypes are becoming available. Strategies to design superior biocatalysts are taking into account more and more the necessity of such organisms to perform in a reliable fashion under environmental conditions. Thus, studies to understand the interaction between xenobiotics and organisms and on the fate, survival and activities of microorganisms in the environment have to intersect with the biochemical and genetic engineering studies. Such a cross feeding will provide the ground for successful interventions into environmental processes and, thereby, lead to optimized strategies for bioremediation.